Another early film to be adapted from the work of H.P. Lovecraft. This time it's The Colour Out of Space reworked as a last gasp of creaky old-school gothic, made just before George Romero's living dead breathed new life into the horror genre. It's relatively dated for a 1960's horror film, but suitably gothic enough to compliment the Lovecraft mythos. Director Daniel Haller appeared to be trying to keep the AIP producers happy by delivering something that looks as gothic as their Poe series of films, whilst injecting more interesting, futuristic story elements. He'd make a decidely more modern 'way out' horror film in 1969, with another Lovecraft story, The Dunwich Horror. Once again we're in the town of Dunwich, but it's obviously shot in England. A young American, played by Nick Adams, arrives to tempt his college sweetheart (Suzan Farmer) away from her old family home, and her old family. Mother (Freda Jackson) is sick and bedridden and Father (Boris Karloff) is obviously hiding something. Is it anything to do with a meteor that fell near the house many years ago? Course it is. The family mansion is in the middle of nowhere surrounded by burnt-out forestland. Something nasty is lurking in the trees. Weird sounds can be heard in the cellar and as for the greenhouse... let's just say that the rabbits don't look very well. Plotwise it's a linear and creaky 'old dark house' formula with the requisite unscary spiders and rubber bats. But the atmosphere of the house pervades (wait till you see the cellar!) and the various creatures mean there's never a dull moment. Lovecraft was working in a world of his own when it came to the horror genre. Here his story is interpreted as a belief in the supernatural vs scientific phenomena. The eerie electronic sound effects, like the pulsating meteor and the things in the greenhouse, help make several key scenes very effective, while the classic cast keep it all interesting. 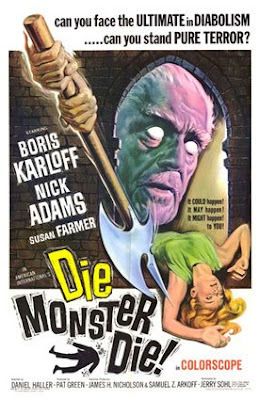 Boris Karloff proves he's still got it, giving an earnest performance. Even though his character is bound in a wheelchair, it amusingly doesn't stop him from creeping up on people. Without him, there would be no film. Handsome, chiselled Nick Adams plays the engaging lead, the stranger from out of town, shunned by the villagers. Despite a promising start to his career, acting alongside his friend James Dean in Rebel Without a Cause, Adams was doing Japanese monster movies by now. Probably scoffed at by his peers, at least he was in films that are still being enjoyed today. No consolation to a serious actor though, he would take a fatal overdose a few years later. If only he'd stuck around, I'm sure he would have had another big break in the business. Love interest Suzan Farmer wears some extremely tight sweaters, but manages to play the damsel in distress without appearing as stupid as this role usually necessitates. She went on to appear in two Christopher Lee Hammer classics, Rasputin - the Mad monk and Dracula - Prince of Darkness. On the commentary track to the latter film, I was thrilled to hear she is now a well-researched fan of horror films! Freda Jackson has a small part as Karloff's ailing wife, bedbound, she's been exposed to the meteor. As her illness worsens, it's anyone's guess as to whether the actress is actually behind the mutated facial make-up or not. Scene-stealing, over-the-top gibbering mad roles were Jackson's forte, showcased in her 'midwife' scene in Brides of Dracula (1960), the old gypsy in Ray Harryhausen's The Valley of Gwangi (1969) and one of the blind witches in Clash of the Titans (1981). I love her work! Terence de Marney has a brief role as the doddering butler - he had a better role in The Hand of Night (1966), as the Queen of the Night's sidekick. Hearing his real voice finally confirmed for me that he was definitely voiced by a different actor for The Hand of Night, in order to sound more like a Moroccan arab! Patrick Magee appears in a brief role as an alcoholic doctor. This unique and instantly recognisable actor was always busy. His cult roles were in Roger Corman's Masque of the Red Death (1964), Amicus Films Tales from the Crypt (1972), and most famously in Kubrick's A Clockwork Orange (1971), where he was in a wheelchair himself. He certainly wasn't allergic to horror films - his first was Francis Ford Coppola's debut feature Dementia 13 (1963). This DVD was the first time this 2.35 widescreen film had been presented anamorphically. The colours are vivid (especially important in the climax) and the detail is so good that you can now pick apart some of the optical special effect shots, like the matte paintings. But the print is a little scratchy and needs a fair amount of restoration. The mono soundtrack is in good shape, but the sparse sound effects and clunky music edits, no doubt due to the tight budget, would now benefit from a digital mix and makeover. This is a good example of what older films look like on DVD, without a hefty amount of extra repair work. I'm aware that my feelings for this film are coloured by nostalgia, but I still think it's eventful and imaginative enough to still entertain today. By the way, the exteriors of Karloff's mansion were filmed at Oakley Court, just a jump to the left from Bray Studios, and a former home of Hammer. Besides appearing in The Reptile (amongst many others), Oakley Court was extensively used, inside and out, for the filming of The Rocky Horror Picture Show. 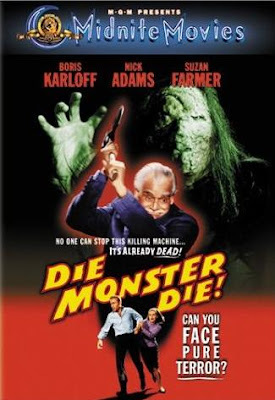 To see a fuller storyline of Die, Monster, Die and some frame grabs, check out the review at StompTokyo! Having only just re-read "The Color Out of Space", I found it hard to believe how little the film had in common with it! Yes, the idea was there, but that was about it. It really wasn't until Reanimator that anyone made a successful adaptation, and even then they had to radically alter the original in order to make it work. Some of the later adaptations by Yuzna and Gordon have also been quite effective, although, again, they often diverge quite dramatically from their original source. Stand alone, this isn't a bad movie, but I think I would have enjoyed it a lot more if I had not read the original story. This one knocked my socks of when I saw it on the tube way back in '70. Every Sunday morning, I would peruse the TV Guide to see what was showing on local stations horror-wise, and this was a perennial regular, to my delight. In the sixth grade, I bought a paperback of Lovecraft stories and I was a bit dismayed that "The color out of Space" was not a verbatim synopsis of "Die Monster Die", but I got over it. Movies Unlimited offers a decent-priced DVD copy; I had a very good VHS copy but it wore out, so I think I'll go ahead and snag the DVD some day soon. Basically this is Rocky Horror's Grandfather complete with a dinner scene with all the contents of the table pulled off, table cloth and all, the Karloff character in the wheelchair and the ancient Victorian elevator (that is not actually functional in this as can bee seen from the cut always and never actually seeing the elevator...elevate. There's a light that the young couple sees and I think someone actually says "There's a light". Obviously Mr. O'Brien (the author of Rocky Horror) had to have seen this film I mean...they filmed at Oakley court and that cannot be by chance. A brilliant observation! Only a few years before ROCKY HORROR hit the stage, too. To me anyway it seems to be where LucasArts got their idea for the Maniac Mansion game, of course I could just be projecting. I still love ole Karloff on the screen regardless.